I signed up for the Cotton and Steel Mini Quilt Swap (#cottonandsteelminiquiltswap) on Instagram without thinking much about it. It was an automatic, "well, duh!" move for me - I love C + S fabrics and I knew I would enjoy making a mini for someone else. This was my first swap on Instagram, though I've done many through my guild, privately, and on Flickr in the past. Then came the Mid-Atlantic Mod retreat, which I realize I've harped on and on about for a while now. I signed up for Melanie's Peek Block class (the pattern is out now!) and decided it would be fun to accomplish both in one fell swoop. I gathered up my materials, and Mel helped me decide on fabric placement for a scrappy block. I learned a lot about how to check that my quarter inch seams are accurate (besides merely eyeballing them, of course :) ). It was easy to just finish the mini up at the retreat; I was so enamored with it! I would totally keep this if it wasn't for the swap (that's how you know you made a good swap item, amiright?). I added on an extra border of the white X's because the mini wasn't big enough for the swap (now it is!). I asked my retreat friends how I should go about quilting the middle and eventually the perfect solution arose: quilt a mini Peek block right in the middle. I sketch-quilted with my FMQ foot to make it stand out more (I marked a few places with my Hera marker). 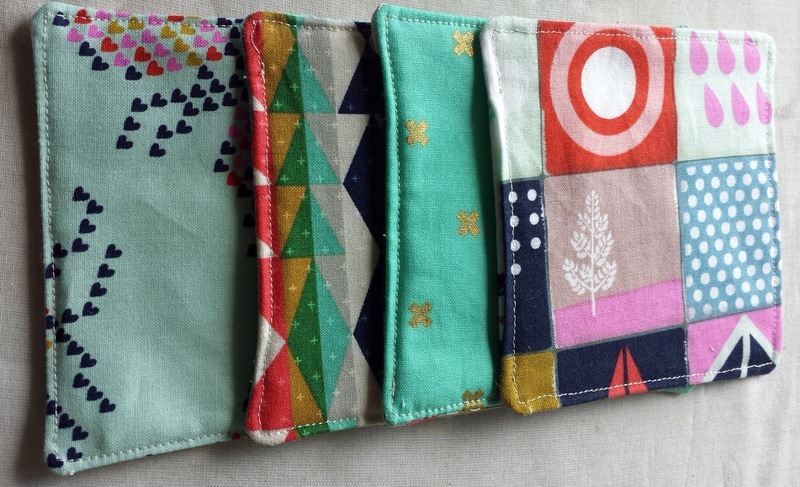 I also made four reversible coasters for my partner out of Cotton and Steel fabrics. For swap extras, I'm big on making something else instead of sending food or chocolate (many times I received packages of melted chocolate! No fun!). Plus, this way you avoid ANY allergies that might come up. I really hope my partner likes it! I have to sew on a label before next week. Then I need to start the extras for my next two swaps (at least the mini quilts are done!). I'll be sure to post when my C and S mini arrives here soon! I can't wait!! P.S. Don't forget Sew Me A Song's Annual School’s Out Flat Rate Shipping Special! $2.50US/$9.00 Canada/$12.00 Everywhere Else. Thursday 6/11/15 through Sunday 6/14/15 - No coupon code needed! 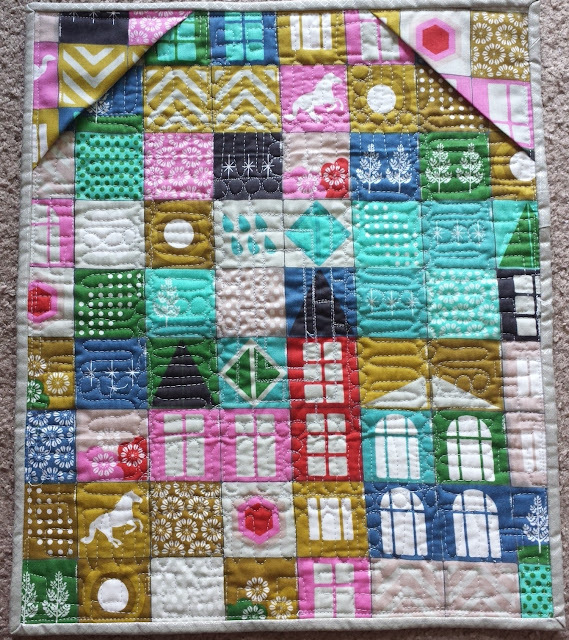 The Peek block makes such a cute mini quilt! I like the balance of fabrics you chose, and fun extras! C+S fabrics look so modern. I like that block too! C+S are my absolute favorites, their fabrics are always so lovely. :) Your mini is wonderful, your partner is very lucky to be receiving it! Cotton & Steel...Mini Quilt...you had me hooked before I even saw a photo! Just gorgeous and I love that "cheater" backing fabric - need to get me some! The peek block works so well as a mini, and I love the idea of putting in usable and sewn extras. I hope your partner loves it! Lucky partner! That's a great mini -- great idea to include the coasters too! Cute block and I really love the pretty coasters. How big did you make them? This is such a cute mini! I love the colors.